When I started CincySpin, a majority of the posts were supposed to be about my new bike, which I refer to as "My Dolce", and the adventures I go on while riding this sweet road bike. Well, those of you who check in often already know that I haven't written (or ridden) much about the 'ol Dolce this year. Busy weekends and a bit of wedding planning have made it a challenge to schedule riding time this summer, but we did have an awesome time on the bikes a few weekends ago at the 5th annual Tour d'Burg in Miamisburg. 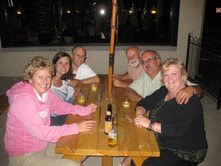 We opted for the 25 mile ride and invited JJ's Dad and step Mom to join us on the road as we pedaled through the streets of the Burg and outlying areas. We enjoyed wonderful weather for the ride and had a nice, mostly flat ride. 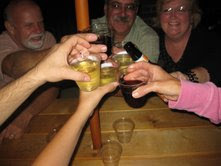 Cheers to a fabulous weekend with family! Last night we booked our plane tickets for the honeymoon! I have already posted about the second stop we'll be making in Kauai. So I thought I'd update everyone on our first stop, Maui. 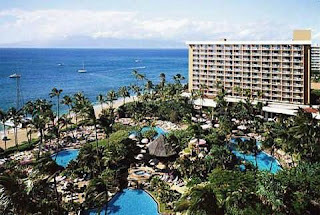 We've booked a room at the Westin on Ka'anapali beach. I feel completely blessed to be going back to Hawaii. I'm really looking forward to exploring Maui and all the wonderful things it has to offer. We are staying in the more "touristy" area, but we've rented a car (convertible, of course! ), so I know we'll be taking some road trips throughout the island while we are there. So, the tickets are purchased, the cars are rented, the rooms are booked. Now all we need to do it pack our bags, get married and head off to those wonderful Hawaiian islands for 11 days of bliss! My sister-in-law's Mom loves baking and makes cakes out of her home, so I definitely had her in mind when we started talking about our reception. We met with Michele, of Michele My Belle Cakes, last Saturday afternoon and had the best time! 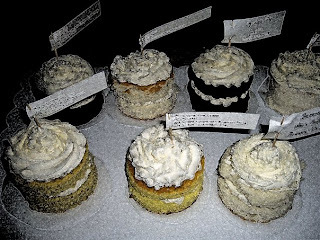 She made us several tasty mini-cakes with so many flavor combination to choose from for our wedding cake. First we went over the design of the cake. A few months ago when I started talking about different cake options, JJ didn't seem to interested in helping with the look of the cake. I wasn't surprised by this because he's not much of a sweets or desserts person. Me, on the other hand, could eat sweets & chocolate for almost every meal. What I loved about our meeting with Michele is that JJ sat down the night before and looked through lots of pictures with me and then he sketched out a design that helped incorporate several elements from the pictures I'd printed out. He was so cute when he showed Michele has drawing, presenting it in a very business-like manner, saying it was just "something he came up with". In the end, I know we're going to have a very fun cake with elements that tie in the design of our invitations and our wedding colors of brown, green, and burnt orange. What a hard job on a Saturday afternoon, indulging in tasting all that cake! Good & tasty are not words that describe how wonderful all these cakes were...I'd go as far to say that they were Out of This World, all of them! We each like different ones, JJ like the White Chocolate Raspberry, I loved the Chocolate Mint with Peppermint Patties filling. We also both really loved the cake with Lemon Icing and Cheesecake filling. They were all such good and unique options. Michele told us to pick 3 flavors, one for each tier of our cake, and luckily we didn't have to decide that day b/c it would have been hard! I'm betting we will go with the Lemon option for sure, and then we'll each pick a flavor for the other two layers. We will soon find out in a few months....maybe another tasting is in order to make sure I loved them as much as I'm remembering!! 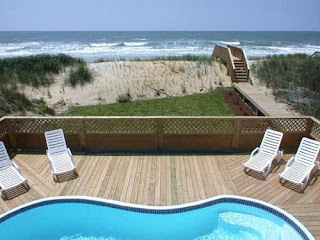 And when a place as beautiful and relaxing as Holden Beach calls your name, I say you must answer as soon as possible! The countdown is on, we are minus 30 days until our vacation to the beach. The group has upgraded this year on the accommidation side of things. We're staying at The Wave, this place is completely sweet! 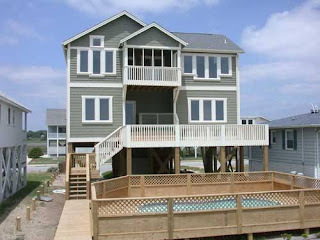 Four bedrooms, all with private baths, a HUGE deck with lounge chairs overlooking the ocean, and drumroll please ..... a Swimming Pool! Most days at Holden are spent lounging in beach chairs nestled the sand, but I'm willing to bet a few hours for me will be spent lounging on a raft in this pool! Hello dear blog readers! I am very excited to share with you that we have booked our 2nd stop on our honeymoon to Hawaii. 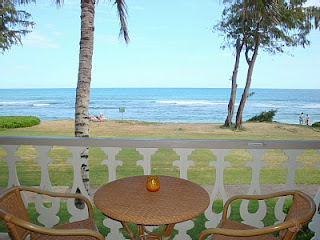 We'll be staying at the Islander on the Beach in Kapaa, Kauai. I'm totally jazzed about the condo I found and think it will be a great fit for our 3 day stay in Kauai. The photo below is a picture from the balcony of our room. I'm looking forward to checking out the island of Kauai. I know several friends who've traveled to the wettest spot in the world (Mount Waialeale) and have rave reviews of the island with the beautiful coastline. A few things I'd like to do while on Kauai are take a catamaran boat out to see the Na Pali Coast, take a hike at Waimea Canyon, maybe splurge and take a helicopter tour of this heavenly place (I hear it's the best way to see the island!). Let me know you're thoughts if you've been to Kauai, I'd love to get some recommendations of restaurants, things to do and the names of any tours/activities you enjoyed while on Kauai. We are still working out some detail for our stay in Maui. We'll be there for about 7 days, so any tips or recommendations you have on this beautiful vacation spot are welcomed too!